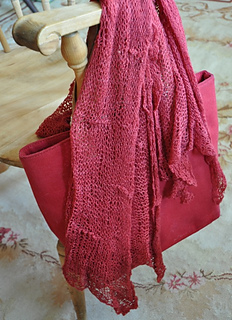 Our easy to knit Aries Shawl has a lovely drape to it. It’s so lightweight you can wear it wrapped around your neck as a scarf or over shoulders on a cool summer evening. Knit on extra large needles, this great beginner project only uses one skein of our naturally dyed merino/silk lace weight yarn. The open stockinette ground stitches create the look of lace without all the fuss of lace knitting. Fun little placed texture ridges add interest to this piece.